It’s about to get real… estate. Watch the official trailer for the second season of the Bajillion Dollar Propertie$ TV show, from Seeso. The half-hour, semi-scripted comedy set at a luxury, cut throat LA real estate firm stars Dan Ahdoot, Tim Baltz, Ryan Gaul, Mandell Maughan, Tawny Newsome, Drew Tarver, and Paul F. Tompkins. This season, Zach Galifianakis, Nick Kroll, Busy Philipps, Casey Wilson, Jack McBrayer, Patton Oswalt, Paul Rust, Randall Park, Dave Foley, Weird Al Yankovic, and Madison Hildebrand guest star. Bajillion Dollar Propertie$ is created and executive produced by Kulap Vilaysack. Tom Lennon, Ben Garant, Scott Aukerman, and David Jargowsky also executive produce. Bajillion Dollar Propertie$, season two, premieres on Seeso, Thursday, October 13, 2016. 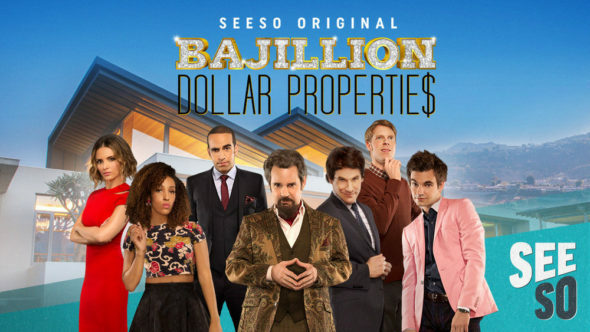 Watch the Bajillion Dollar Propertie$ season two trailer, from Seeso. What do you think? Do you subscribe to Seeso? Are you a fan of Bajillion Dollar Propertie$ TV series? Do you plan to stream season two on Seeso? More about: Bajillion Dollar Properties, Bajillion Dollar Properties: canceled or renewed?, Seeso TV shows: canceled or renewed?